Is it a car? Is it a scooter? No. It’s Zbee, a urban pod mobility. Zbee is a joy to drive. The small but powerful electrical motor enables lightning fast acceleration and ensures that Zbee emits neither noise nor pollution. The tiny form factor makes it agile in traffic and easy to park. Up to three Zbee’s can fit in a single parking space. The key to truly reaching energy efficiency is reducing the weight of the vehicle. More weight means more batteries. The Zbee’s innovative composite design keeps it significantly lighter and more energy efficient than other vehicles similar in size. Why carry the extra baggage? Zbee is weather protected, seats three people with ease and features a protected luggage compartment. The parking brake has a lock and protects the vehicle from theft. It’s designed around your actual needs. Since when did you need a vehicle weighing 1500 kg, with a top speed of 200 km/h, just to go shopping? We’ve invested a lot of time and effort into designing Zbee for maximum safety. The state-of-the-art FRP (Fibre Reinforced Plastic) material have enabled us to strike the perfect balance between lightness and safety. 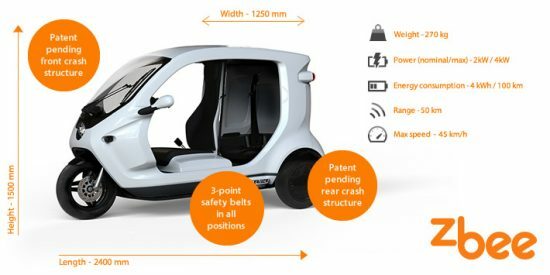 Also featuring three point safety belts, Zbee is many times safer than other lightweight vehicles. The Zbee will retail at a highly competitive price point. But what’s truly groundbreaking is the efficient energy usage. The Zbee uses 4 kWh per 100 km, equating to somewhere around 0,6¢ per kilometer in today’s electricity cost. Additionally, the design of the electrical motor means it requires little to no ongoing maintenance. We believe in shared moblity solutions and interconnected systems to manage fleets of vehicles. That’s why all Zbee comes with ZbeeConnect. Our connected vehicle data platform to enhance the usability and experience of our vehicles. Let’s delve into some of the most common misconceptions about electric vehicles. The ZBee uses 7% of the energy of a fossil fuel driven city car. View the ZBee from all angles in our image gallery.